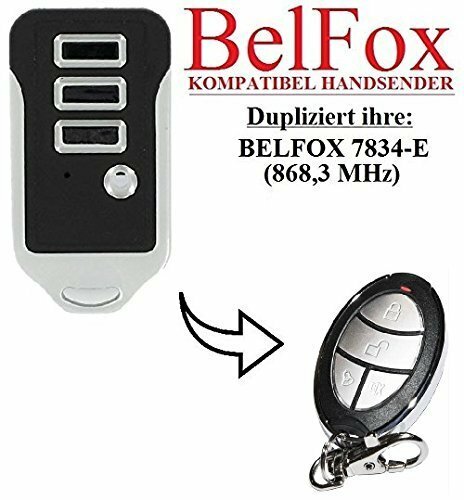 This is a high quality 868.3Mhz remote replacement clone that can completely replace your BELFOX 7834-E remote. ///Parameters:• 868.3Mhz frequency•battery and keychain included•High quality remote replacement!! ///HOW TO CLONE YOUR REMOTE: • You need to erase the remote first : 1)Click and Hold LOCK and UNLOCK buttons together - Led will flash 3 times 2)Keep holding LOCK button and release UNLOCK button (keep holding LOCK button since step 1) 3)Push UNLOCK button 3 times, Led will start Flashing Non-Stop. (Keep holding LOCK button since step 1) • Next you need to clone your original remote : 1)Put both remotes Into back to Back position (II). Make sure they have direct contact , touching, push a bit to make them touch each other harder. 2)Click and hold 1 button on your original remote and 1 button on your clone remote. Keep holding until led will make : 2 blinks > 3 blinks > Steady = Successfully cloned, only after the light goes into steady. • If for some reason the clone does not go further then 2 blinks , it means the signal does not go through, please shift the remote slowly up and down, very slowly until you get the point where it will go through. LINK FOR THE PROGRAMMING VIDEO --> • https://www.youtube.com/watchv=QwEUOa6cck4 • Note: you don't need an access to you control board or receiver!! !///We are fully committed for 100% customer satisfaction. If the item arrived damaged, got lost in mail, was not what you wanted to buy, please contact us and we WILL resolve the matter until you are fully satisfied with your purchase.IF YOU HAVE ANY QUESTIONS ABOUT YOUR PURCHASE PLEASE CONTACT US!